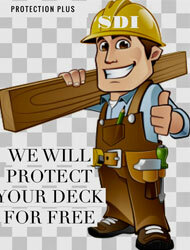 Long Island's best deck maintenance company! A lot of Contractors "also do decks" We only do Decks! Just a short note to say thanks for washing my deck and making it look like new again. Your organization continues to offer the best service of any contractor who worked on our house! All of your workers are polite and knowledgeable and your jobs are complete on time. Above and beyond in customer satisfaction would be an understatement. Bob — Too often feedback is only given when people are dissatisfied and not when there is outstanding service. To say that you and your staff go above and beyond in customer satisfaction would be an understatement. Janice and I appreciate all the help and guidance you have given us. Although I am sure there are times you must think we will never learn about deck maintenance, you never have given us an indication that our questions and concerns are silly or just plain dumb. We thank you for the great service. We cannot possibly say enough wonderful things about Scrub A Dub Industries. We recently completed an extensive remodel and addition to our home. Our old large deck was removed and replaced with a beautiful modern deck of our design. Scrub A Dub Industries was there every step of the way to guide us through the entire Maintenance process once the deck was completed. They made every aspect of this project easy and painless. The initial step is meeting with Scrub A Dub to formulate a color design and budget. They explain all the options available to you and the pricing. They never try to push a feature on you that you do not want. In fact, in our case, they discouraged us from a component of our project because they felt we would be unhappy with the result. They were correct. Their honesty and professionalism are something a homeowner always hopes for but seldom finds. Once you have approved your color choice and budget, Scrub A Dub handles everything else. Their Project Manager does not just “stop by” to check the work, but is always on site when work is being done. Telephone and email questions are always answered quickly and politely. The workers show up when they say they will, and always keep the job site tidy. Even after the job is complete, Scrub A Dub Industries is still there to answer my questions. Their customer service is outstanding and ongoing. Our new Deck is beautiful and easy to maintain. We received the product we wanted at the price we agreed upon. We are very pleased. We cannot say enough wonderful things about Scrub A Dub Industries. They provide a high quality product, have excellent customer service, are always professional, and are competitively priced. We have recommended them to friends, and will continue to do so in the future. I wanted to thank you and your guys for the great job they did on repairing my Deck even though it was well out of warranty. Every employee of yours that I’ve come in contact with has been a pleasure and joy to work with, just like the boss I guess. It says something about a company that stands behind their work when they don’t have to. Thanks again for the good job. This letter is written to anyone considering restoring a deck. This letter is written to anyone considering having their deck restored. It is our opinion that Scrub A Dub Industries represents the BEST in the deck industry. We contracted with Scrub A Dub Industries to restore our deck after careful consideration of various contractors. The primary reason we selected Scrub A Dub was their reputation in the community and continued praise from those who had work done by Scrub A Dub. 1. They worked with our ideas and offered suggestions to enhance the look and performance of our deck. 2. Anything we asked their reply was “Sure, we can do that”. 3. Work was done in a timely manner, they were there when they said they would be. 4. They walked us through the process and made sure we were comfortable with each step. 5. They provided reliable subcontractors names and contacts for our other related projects. 6. Their employees were respectful, professional and loyal. 7. Rob, & Rich are awesome! We would unequivocally recommend Scrub A Dub Industries to anyone considering a professional Deck contractor. We would be happy to speak with anyone or show our deck to prospective clients in the future. Larry & Ken Fleshmen,-South Hampton NY. Copyright © Scrub A Dub Industries. All rights reserved.